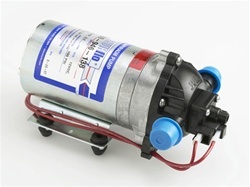 Using a flow pump with your hydrogen system will quickly purge the gas saturated water from the cell, this effectively frees up more precious electrode surface area increasing production. The Hydroxy gas will separate from the water in your electrolyte holding tank. Solves the problem of pressure problems in the cells due to long water lines. Allows for a overall cooler operating temperature~ as much as a 50% reduction.